Yesterday morning I was outside talking to my neighbour who mostly keeps to herself. She is a single mother with two young boys and yesterday's conversation was the longest one I have ever had with her in the year they have lived there. When I came inside I checked my emails only to discover Patter's Scripture Challenge for this fortnight --- WOW - what is the Lord trying to tell me. I think I better become a better neighbour as the word for this fornight is "Neighbour". 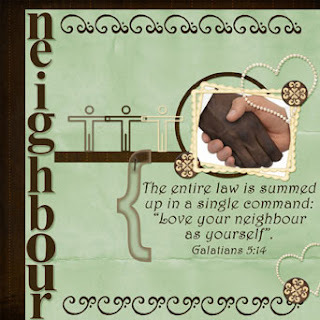 The last two Sundays my husband and I have been attending talks by John MacKay of Creation Research and the first Sunday I learnt how the different races came about which may help you see the reason I chose to do my page as I have. Acts 17:26 says "And hath made of one blood all nations of men for to dwell on all the face of the earth, and hath determined the times before appointed and the bounds of their habitation." My digital page was put together using the following items: Alpha and brushed border by Durin Eberhart; Green paper by Brandy Murry; Brown Paper by Paula Wright; Frame by Amanda McGee; Pearl Heart and Bracket by Amanda Sok; Fancy brad by Kerry Veale. The photograph was found on the web somewhere. What a beautiful page, and I LOVE how you reached out to your neighbor and had such a great conversation! And all before you read my post!!!! God is so good! What a great lesson for all of us. May you be a blessing to your neighbor in the weeks and days ahead!! Beautiful layout and wonderful testimony. Your page this week is very inspirational, Anne-Marie. Love the photo you found, too. Very beautiful, Anne-Marie! I see you're a ScrapGirls fan, too! I love the layout! how beautiful it is that you spoke with your neighbor for so long and then "neighbor" is the chose word! Simply priceless! love the digital layout... and "back story"!!! Wow! This is powerful! I've heard the creation talks of Ken Ham and he also explains how the races are all so genetically similar. Neat concept and you've displayed it so beautifully!